Spring Hofeldt's tributes to the offbeat characters of the animal kingdom cast this ostrich as your loveably awkward friend or favorite social critic. 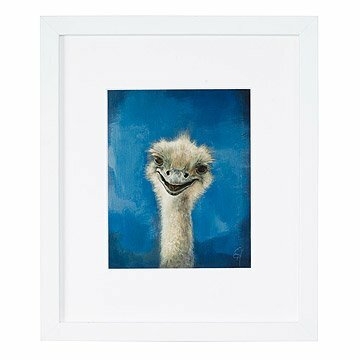 Against a bright blue backdrop, Otto leans in with his endearing bird grin as if to say "it'll be ok." Each ostrich portrait is printed using acid-free paper and presented under an acid-free mat and Bonanza wood frame. Made in the USA. For more from this collection, meet Ned , Francine, and Squawk. One of the favorite Christmas presents given! A Christmas gift for daughter. Makes you smile! It is quite cheerful. Well packed! We can't wait to hang all 4 together in our new house! Very nice, interesting, and just make you happy to look at them.